Shreevathsa . Professor & HOD, Department of PG Studies in Ayurveda Samhita and Siddhanta, Govt. Ayurveda Medical College & Hospital, Mysore, Karnataka, INDIA. A study was conducted to access clinical efficacy of ‘Kharjooradi Mantha in the enhancement of Ojo Guna in the subjects of Madatyaya. As Madhya has 10 Gunas which are exactly opposite to the 10 Gunas of Ojas. 35 patients of Madatyaya were selected by simple random sampling method. Kharjooradi Mantha was given in two divided doses once in the morning and evening after food with Jala as Anupana for duration of 28 days. Gradation scale was used depending upon their severity to assess the effect of the treatment objectively and to monitor the disease; however at the time of statistical analysis the outcome was statistically analyzed i.e. before treatment and after treatment by using Descriptive Statistics, Chi squares test and Cramer’s V by using windows SPSS Software. It was revealed that Kharjooradi Mantha was effective in the enhancement of Ojo Guna in the subjects of Madatyayia. It significantly reduced the symptoms such as Chardi, Aruchi, Hrullasa, Tandra, Staimitya, Gaurava, Hikka, Svasa, Kasa, Pralapa, Sirakampa, Parashvashola, Nidranasha, Trsna, Daha, Dourbalya, Murcha and Sweda. Kharjooradi Mantha did the Tarpana, Agnideepana and Anulomana there by increasing the Ojo Gunas. JAVEED, Aqeeb; CHATE, Vasudev; ., Shreevathsa. A CLINICAL STUDY TO EVALUATE THE ROLE OF KHARJOORADI MANTHA IN THE ENHANCEMENT OF OJO GUNA IN MADATYAYI SUBJECTS. 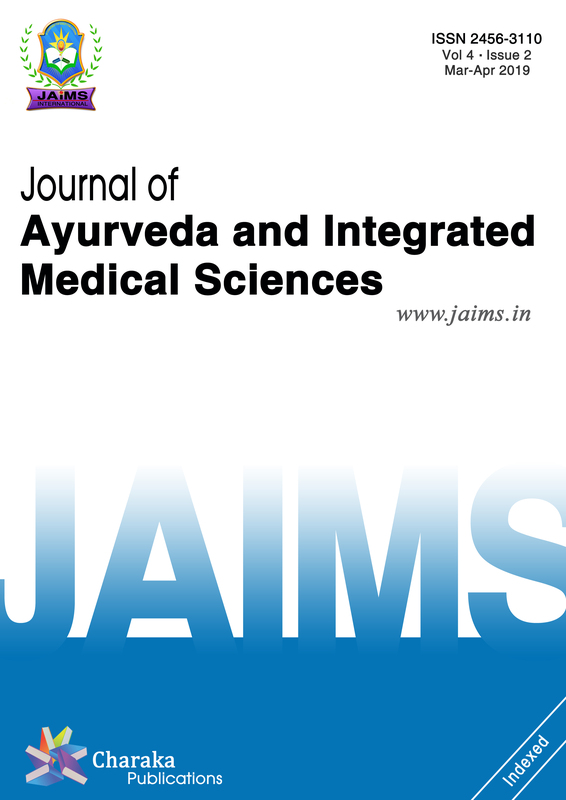 Journal of Ayurveda and Integrated Medical Sciences (ISSN 2456-3110), http://www.jaims.in/index.php/jaims/pages/view/Citation, v. 3, n. 5, p. 14 - 20, nov. 2018. ISSN 2456-3110. Available at: <https://jaims.in/index.php/jaims/article/view/701>. Date accessed: 25 apr. 2019. doi: https://doi.org/10.21760/jaims.v3i5.13813.